In December of 1981, a new military regime took control of the country of Argentina. The new junta was made up of Gen. Leopoldo Galtieri, Brig. Basilio Lami Dozo, and Adm. Jorge Anaya. The latter was the main architect of a military solution to Argentina’s claim over the Falkland Islands, a claim disputed by the United Kingdom. The Falklands are made up of two large and many small islands east of Argentina in the South Atlantic Ocean, and Adm. Anaya wanted to seize control of them and thus divert public attention away from the chronic problems of the Argentine economy. He also wanted to mobilize the country’s patriotic feelings. 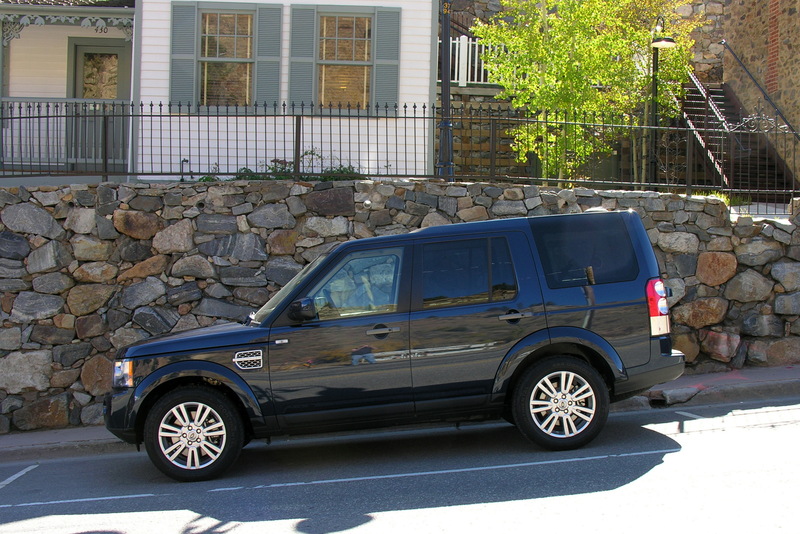 What does all of this have to do with the subject of my SUV review, the Land Rover LR4? Well, in the buildup for the Falklands War, the British sent a boatload of Land Rover Series III’s aboard the Atlantic Conveyor towards the Islands. The vehicles were for the purpose of transporting combat troops into battle upon arrival. The Conveyor was hit by an Argentine missile and sunk, leaving hundreds of Land Rovers at the bottom of the Atlantic and many British troops “yomping” (walking) into combat. The Land Rover Company wasn’t sunk, however, and 30 years later they manufactured the lovely LR4 that I recently drove for a week. The Baltic Blue beauty I tested had a M.S.R.P. of $58,515.00, which included a heavy duty package as well as a $9,155.00, seven seat LUX package. When it was delivered to my home, I was particularly excited to take my first drive in a Land Rover. The company makes five models, which are split into two series: Land Rover (LR2 and LR4) and the higher-end Range Rover (Evoque, Sport, and the $80,000.00 Range Rover). What I had my hands on was the top-of-the-line Land Rover, a relative bargain when compared to Audi’s Q7 ($8,000.00 more), Mercedes’ GL450 ($18,000.00 more), and Toyota’s Land “Cruiser” ($15,000.00 more). I grabbed my camera (and wife), and headed for Central City for a nice afternoon jaunt. The LR4 sits up nice and high and has a terrific SUV truck-like feel. The ride is super and the visibility is off-the-charts; it’s like riding in an Amtrak Superliner. Options are all over the place inside (almond/nutmeg premium leather seating), including nav, back-up camera, armrests, electronic steering column, and an analog clock. Topside the vehicle has THREE glass panel roofs, the front one powered. I know I’m gushing about this rig, but truthfully, it was just superb. In the Central City/Blackhawk area, I cruised up and down the little streets and gleaned a lot of eyeballs in the process. The LR4 rolls on 19”, 7-split spoke alloy wheels and of course has the iconic mini-grills on the fenders as well as a rather sophisticated Xenon headlight setup. The tailgate is an asymmetric, two-piece design and I liked it. Power to the four wheels is provided by a 5.0 liter, 375 hp V-8 that can set you sailing from zero to 60 in under 8 seconds. A six speed transmission puts the power to the transfer case. For off-roading, a knob on the console provides a Terrain Response system for surfaces you are likely (or unlikely) to encounter while motoring away from the highway. Thirty years ago a bunch of Land Rovers were sunk and the British soldiers were sent into battle afoot. But the UK won the Falklands War and the Land Rover Company has produced over four million vehicles worldwide since 1947. I sure had a blast in the LR4 I had for a week. The new, bigger, Toyota Prius V (vee) was introduced in our country in October of 2011, and was designed as a station wagon/multi-purpose vehicle to complement the Prius lineup. The Prius has been around since 1997 and is America’s number one selling hybrid. In fact, it accounted for almost 51% of the 270,000 or so hybrids sold in America last year, and globally the U.S. accounts for half of Prius production. The name on the car, “Prius”, is Latin for “before”. 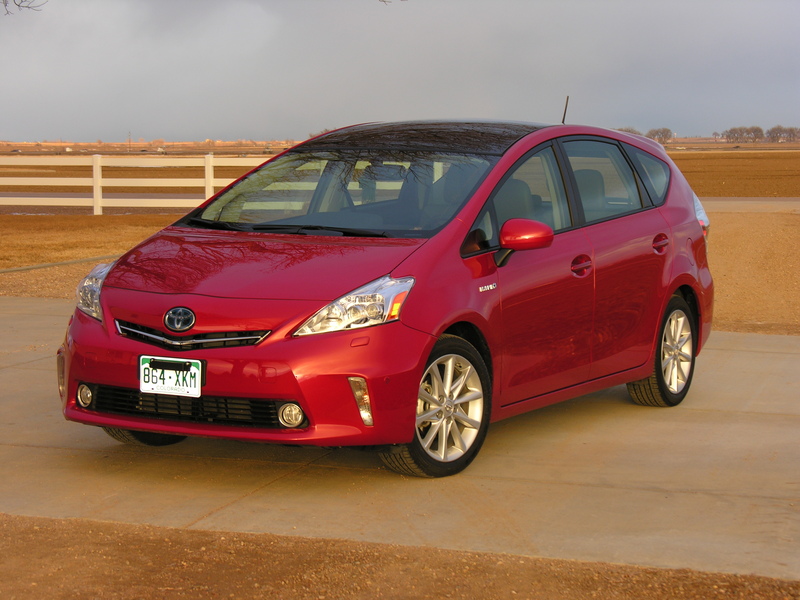 The Barcelona red, front-wheel drive 2012 model Prius V was delivered to my house last week and I immediately planned a trip to Estes Park to buy lunch for my wife, Ruth. I punched the button to begin calculating the fuel mileage for the trip, and we headed for the Other Side (on the other side of Estes). I can’t really complain about the power it provided going up through the canyon, and handling was suitable, as was the ride. In a hybrid like this, the car has a gas (98 hp) engine and two electric (80 & 36 hp) motor/generators that combine (through a planetary gearbox) to power the wheels. Electric motors are actually generators, and visa versa. Put the juice to a motor, and you get motion. Crank the generator, and you get electricity. So these motor/generators in a Prius serve the dual purposes of wheel power and battery charge. And gasoline is the “motion lotion” that makes the car go – no gas, no go. When you leave a stoplight with a Prius, electric power gets you rolling and gasoline power takes it from 15 mph. When you slow down for a light, the weight of the car turns a motor/generator and charges the nickel-metal hydride battery. You can select “EV mode” on the console and creep around with electric power only, for instance in a parking garage at night. You can push a “power” button, too, and get maximum acceleration with max gas power. You cannot plug in a Prius, but I understand a plug-in model is being introduced. It will allow you to go, say, 50 miles without starting the gasoline engine, and the car is to be more expensive. How does all this stuff work together for J. Q. Public, just trying to reach his or her destination? Pretty darn good, I’d say. I thoroughly enjoyed the week with this 5 passenger car, and by the way got 52.5 mpg on that trip to Estes Park. Even with a “fudge factor” that may be involved with the car’s computer, it’s excellent economy. The Prius V was equipped with heated leather buckets, as well as the “Advanced technology package”, that added $5,580.00 to the base price of $29,990.00. M.S.R.P. therefore came to $36,622.00 with the floor mats, wheel locks, and freight. In that package was hard disk drive navigation, back-up cam, 8 speaker stereo, satellite radio, USB port, Bluetooth phone setup, radar cruise control, double stationary moonroof arrangement with shades, electric power steering, power windows/locks/tailgate, and digital climate control. So many gadgets are included, that I understand Nancy Pelosi tells her friends that if they want to know what all is present on her Prius, they need to buy one.